A little update on our boy Marc Anthony first. 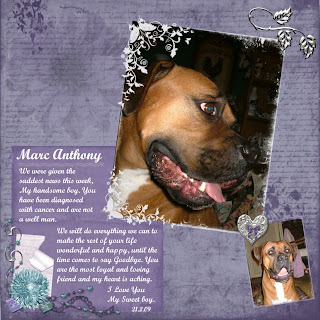 Our sweet boy has Canine Lymphoma and we are fundraising to help pay his vets bills. He had his 2nd chemo treatment yesterday and is a bit quiet today and sleepy. I hope he doesn't have any side effects from this one. I want to Thank everyone for their generous donations and kind words and prayers. 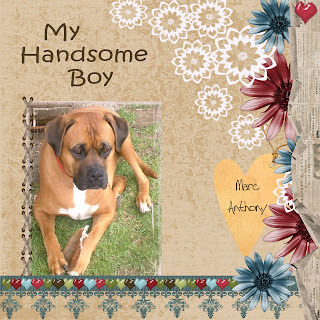 He is a big part of our family and we will do all we can for him to give him a happy life. 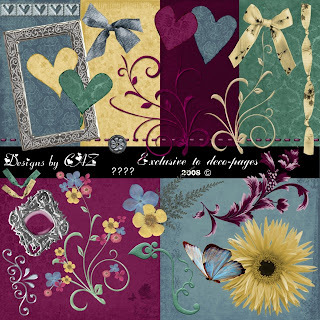 Anyway, I have another freebie for you today and remember we are also selling a collab kit at deco-pages.com starting on the 14th March . Thanks for taking the time to visit and read Marcs story. 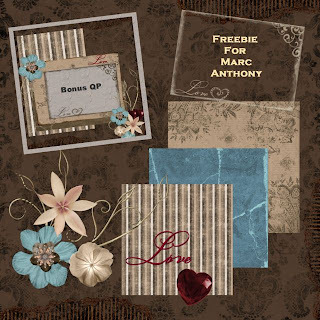 If you enjoy my freebies, a small donation would be very much appreciated. I have another freebie for you with a bonus QP. I hope you like it. 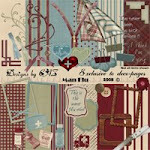 We are also selling a fundraiser kit for Our sweet Marc Anthonys chemo at deco-pages.com. 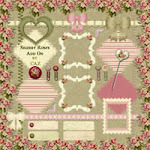 This kit will be on sale by the 14th March, so please come over and check it out then. Lots of generous designers are contributing to it. Keep Marc in your thoughts and prayers please. 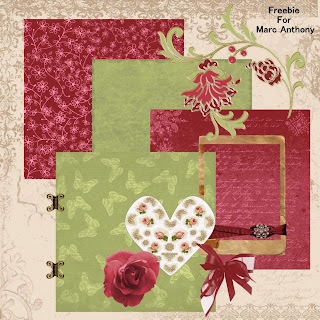 Here is my first freebie for you in ages. I hope you like it. 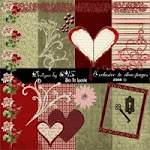 It is a QP created with the Collab Fundraiser kit that will be available around the 14th March at deco-pages. Myself and some other generous designers are creating a kit to help fund Marc Anthonys chemo. 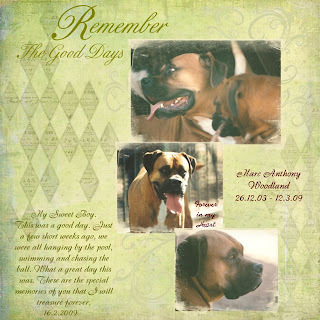 He is such a sweet dog, a member of our family, and we want to give him every chance at a longer quality life. He is only 5 years old, too young to leave us yet. He had his first round of chemo this week and seems to be improving already, and with very few side effects, except a weak bladder, so I am busy washing blankets everyday. But it is so little to ask, for him to be feeling better and being on the mend. So, please come over to deco-pages.com soon and check out the kit or maybe you could find it in your heart to give a small donation towards his treatment. Thank you all for your kindness and taking the time to read our story. Wow! it seems like I have been gone forever. We have moved to the country and I have been unable to get a decent internet connection, until now. I am finally ready to get back to designing and hopefully sharing more freebies with you all. I appreciate the Thanks I get from you as it is nice to know you enjoy my work. On a sadder note we were given some devastating news last week. 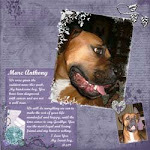 Our Sweet boy Marc Anthony has been diagnosed with cancer (canine lymphoma). He will be starting chemo tomorrow and we hope it will be a success and give him some quality of life for a year or more. I know you pet lovers will understand how heartbreaking this news has been. 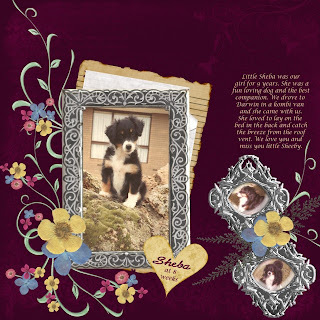 I have been so blessed though as Deb, my boss at deco-pages has generously offered to waive her fees and sponsor a fund raising kit to help with Marcs vet bills. Many of the wonderful designers in our community are generously donating items to the kit, so it should be a beauty. I hope to have it up for sale at deco by the second week of March, so keep an eye out for it. I will keep you all updated on Marcs progress too. Thanks for taking the time to visit and read our story. 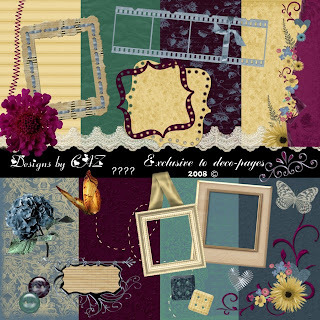 I have a new kit ready for the store at deco-pages but I don't know what to name it. If you come on over and sign up for free, you will have a chance to win the whole kit by posting a name suggestion for me. My DH will choose a name on Sunday evening, so you have until then to post. I have been a bit under the weather lately. My back has been playing up, but such is life. There are plenty of people worse off. Anyway I will have a freebie for you by the end of the weekend, not sure what, but I will make you somethin' pretty. While you wait, why not have a look at this months Club Deco kit. 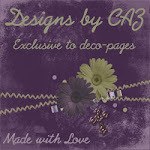 The above previews are my part of the kit along with plenty more from our other designers at deco-pages. It is well worth the $36 a year to get 12 massive kits, plus other freebies just for club members and 10% discount in our store. There are also more purchase options too. Come on over and have a look.